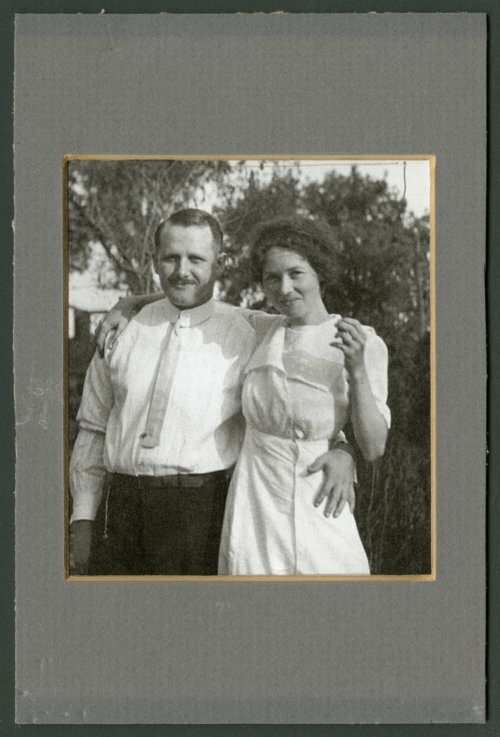 This is a photograph of Walter G. Thiele and Maude Baker Thiele. Walter was born in Washington, Kansas, the son of George and Elizabeth (Baumberger) Thiele. Growing up he worked with his father in an abstracting business. After graduating from high school, he spent several years as a school teacher and later entered the University of Kansas Law School. While attending law school, he worked for Judge John Quincy Adams Norton. After graduating in 1910, he passed the bar examination, and Norton offered him a job. The firm of Norton and Thiele was formed in Lawrence, Kansas. During his legal career in Lawrence, he served as city attorney and represented the University at various times. In 1932, he ran as a Republican candidate for the Supreme Court and was elected. After being elected to his first term, he ran un-opposed in subsequent elections until Kansas abolished the procedure of justices running for office. Eventually, he became the Chief Justice shortly before his retirement in 1957. On July 26, 1911, he married Maude L. Baker in Kansas City, Missouri, and they spent most of their married life living in Topeka.